I'm here now to share with you my March Favorites. I know it's already 2nd April now. But, not too late to share with you my March Favorites right? So ya. Let's move on to the topic for today. I seriously love munching on this. Once you start eating it, you can't stop. HAHA. This cookies not the same as other cookies. This cookies taste so yummy and very soft feeling when you start munching it in your mouth. Okay okay. I'm not good on how to explain it. BUT! 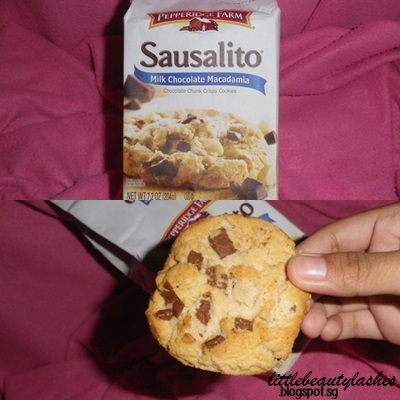 I swear this is the best cookies that you must try! ﻿My Love bought this from Robinsons Sale At Singapore Expo. The usual price is 2 for $11.90. But its on sale, so the price is 2 for $10.50. Besides Robinsons, I'm not too sure where you can find it. Because I did try to find at NTUC but I didn't found them. I guess, it's only can be found at Robinsons. I've been using this NAKED 2 since the day I receive this as my birthday gift from my Love. Yes. I love everything about this NAKED 2. Will never give up using this NAKED 2 because this eyeshadow colors is AWESOME! To know more about my review on this, click the link here. I've been using this perfume since the day i receive this perfume as my birthday gift from my Love. I love the floral smell from this perfume. So classy :D To know more about it, you can click it here. Besides using my makeup remover, I'm also using this Vaseline to remove my eyeshadows and mascara. To me this is the easiest way to remove my mascara. Certain makeup remover so hard to remove all the mascara on my eyelash. But, by using this Vaseline, slowly apply to my eyelashes and then slowly wipe it with cotton wool or tissue and they goes, no more mascara left on your lashes. This Vaseline is so cheap and it does works great to remove mascara and eyeshadows :) Click here to read more about this Vaseline. I've been using this foundation almost everyday. So far to me this is the best foundation that I own :) Been using this for 1 year plus already. It is quite expensive. But its worth it! Click here to know more about the review. This is the best body butter that I own. Makes my body feel so smooth. And it smells so nice too. To me it smells like biscuit. Haha. I use this body butter whenever I'm going out. The body butter size so big. I guess it takes so long to finish it. Hehe. To those people that love body butter, why not give it a try for this Spiced Vanilla Body Butter. Its really really smell so nice. You can purchased it at any Body Shop. If I'm not wrong, the price for this is $32.90. As you can see in the picture. I use it everyday and its left half of the bottle already :P I use it with my loofa. It smells orange. Feels like orange juice on my body whenever I use it. Hehe. Yes. The smell so nice! That's the reason why its left half of the bottle already :D If you are looking for shower gel that smells orange, you can try this Satsume Shower Gel. You can purchased it at The Body Shop. That's the end of my March Favorites post. Stay tune for my next update. oh my gosh I love those cookies :) I also love using Vaseline for removing mascara, I actually alternate between that and my jojoba oil. Great list the body butter is something I would love to try. Cookies & makeup? I'm in! Great Blog! Thanks for following me on GFC! Followed you back on GFC. My goodness the cookies are making me hungry lol! And I'm in love with that chanel color lipstick! I have the naked 2 palette and Love it!! Yay! I love it too for the NAKED 2 palette ^^. The fact you included the cookies made me laugh :) they look yummy! I didn't realise you can use Vaseline as a makeup remover! I just knew about baby oil. the chanel lip stick looks like such a pretty colour !! 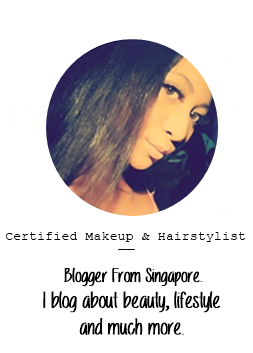 Just stumbled across your blog love it ! Following you back! I love the Pepperidge Farm Carrot Cake cookies...and have you ever tried the pumpkin cheesecake ones?? They are a seasonal item, but they're soooo good if you like pumpkin! Does Vaseline also work to remove eye liner? I never tried it! those cookies look delicious! what a fantastic march favorite pick!